The flow sensors will be detected from the main board like a normal 3-pin fan. Normally it is possible to set the main board software this way, that depending on the rotation speed (or if there is no rotation at all) the computer will be shut down. This makes it possible to have a very good and save way to protect the hardware without additional costs. 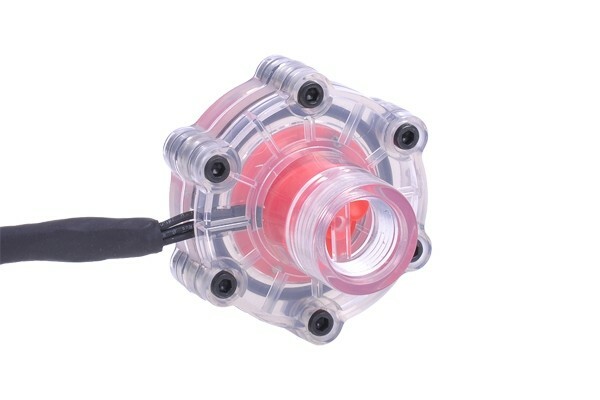 The flow sensor will be detected and will get the input of the rotation speed like a normal 3-pin fan. If the fan controller includes a Display and / or an alarm function, they can be used also with the flow sensor. The signal from the flow sensor will be detected as a “puls” and can be calculated to the needed unit of measurement (for example l/h or g/h). If you use an Alphacool Heatmaster, it is possible to start an alarm when the flow rate is too low or even to shut down the computer.